Some woodworkers will make complicated jigs that have adjustable angles with clamps and attachments to facilitate cutting tapers. Building a jig like this takes all morning and you get to use it once or twice. You can make a simple throw-away jig out of scrap plywood that lets you create custom tapers in just a few minutes. You can customize each project without wasting your time using trigonometry and math to figure out degree of taper. Get a piece of plywood approximately 36 x 6 inches and cut your own one-inch taper jig. Set the table saw fence at 3 1/2 inches from the blade. 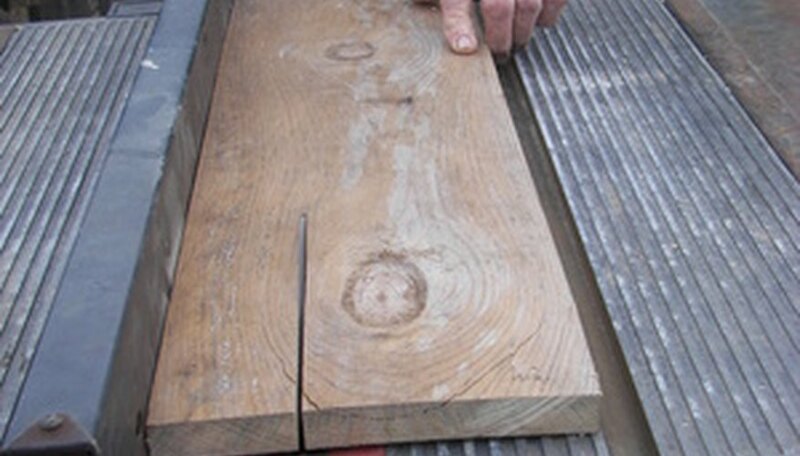 Lay the plywood down on the saw flush with the fence, slide it up and touch the blade with the leading edge. Lay the leg down on the plywood with the top left corner edge of the leg just barely touching the inside edge of the blade. Place the tape measure at the bottom of the leg, and pull the bottom of the leg to the left to a measurement of 4 1/2 inches from the fence, creating a one-inch slant from the top of the leg where it touches the blade to the bottom of the leg where it is 4 1/2 inches away from the fence. Draw down the inside and bottom of the leg. Extend the bottom line out to the edge of the plywood, creating a large “L” shape facing to the left. Cut the left-facing “L” out on the band saw. Lay the jig back down on the table saw. Lay the leg into the crotch of the left-facing “L,” with the leading edge of the leg going into the blade. Holding on to the leg with the left hand, the jig is pushed through the saw with the right hand thumb on the back of the jig with the fingers of the right hand applying downward pressure on the leg. The saw blade will cut off the end of the left-facing “L” when you get to the end of the jig. Woodworkers bench notes: Combination and straight edge taper jig"
"Woodworking tips: Table saw taper jig"